Royal Caribbean are in the process of planning a new class of ships according to Richard Fain, the company's Chairman and Chief Executive. He said: "We have been considering our next new building project and we feel that the time may now be right for such a move. It would also probably be the start of new series of ships, which would incorporate our latest learnings about efficiency and about guest amenities. We have been working intensively on developing a design that reflects our innovative spirit, but in an efficient package and we think that we are near to an acceptable outcome." Royal Caribbean had previously stated that they would not be expanding their Oasis class ships and currently don't have any ships on order. 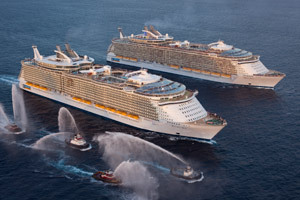 After the launch of the world's two largest ships, that are so big they use neighbourhoods opposed to deck numbers, what can we expect from Royal Caribbean? Surely they can't build anything larger, or offer even more choice in entertainment, dining and accommodation? Well not unless they are building a floating island. When quizzed for further details on the plans for the new ships Fain wasn't keen to give anything away: "I am a little reluctant to get too specific about it because we don't have a final deal. We are still working on that, and we don't like to talk too much of it in advance. I think we're talking about it for Royal Caribbean. Our tendency in the past has been to build a series of ships, and while nothing is final that is probably the direction we would go in here." With Royal Caribbean offering some of the most innovative ships, entertainment and accommodation at sea it will be interesting to see what they come up with next.